Samsung has released a foldable smartphone called the Galaxy Fold. The Fold will go on sale in just over two months time. It's not the first foldable phone to be released but experts seem to be very excited by the news. 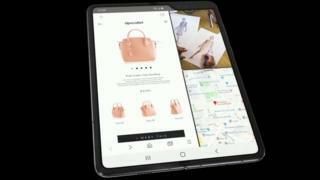 Samsung say the 'Galaxy Fold' opens up to create a 7.3in (18.5cm) tablet-like display. The company has said that they designed a new type of hidden hinge system that would withstand hundreds of thousands of folds and unfolds, and have a battery on each side to extend battery life. The phone also has six cameras - three on the back, two on the inside and one on the front - which means it could take photos however it is held. A 4G version of the Galaxy Fold is set to go on sale on 26 April and will start at £1,515. A more expensive 5G edition was also promised. Not much more is known about the phone so experts are sitting tight and waiting for it's release.